It’s been a while! How have you been? This year, I was able to make time to participate in two of Den of Angels’ Anniversary events. It was a lot of fun! Today I’d like to share the first project I completed, a sock outfit for the It’s So Basic Sock Extravaganza. This year’s theme was Back to Basics, so as the wonderfully long name indicates, the sewing competition went back to the basics too: sock outfits. Embellishments and notions are allowed. Exception: Lace and ribbon must be from socks. At first you might think, “Socks? What can I make from socks? !” as I did. But as the seventy (yes, seventy!) wonderful entries show, there’s a lot you can make with socks! I was particularly impressed with a cute cat jumper, a chic Parisian-inspired set, and – believe it or not – Victorian-style entries! It is simply inspiring to see how many wonderful outfits can be made with the humble sock. I encourage you togo check out the entries, and you can see the three amazing winners here. Enjoy! From here, I didn’t know what I wanted to do. The only thing I was certain of was that I wanted to go for a cute look. It’s only natural with so many hearts, right? So I took the heart-pattered ankle socks first, and fashioned a pair of shorts. It was a bit of an experiment and I figured, “If it doesn’t work, I have another pair to try it with.” Luckily, it worked on the first go! The shirt was next. I was quite nervous as I only had two sets of the knee socks, so if I messed up I’d have to change my plans. Luckily, the raglan style was easy to draft. And I actually got the pattern too big at first, which turned out well as I could take in the seams after trying it on Corinne. (It wouldn’t have worked so well if I had cut it too small!) This allowed for a more fitted look, which I am quite pleased with. The appliqué is from the child’s sock in the materials photo. I have one more, so I was thinking about making a matching bag, but I ran out of time. Maybe next time! With the main pieces finished, it was time to round out the outfit with accessories. Since the theme was a sock outfit, of course I had to make matching socks! 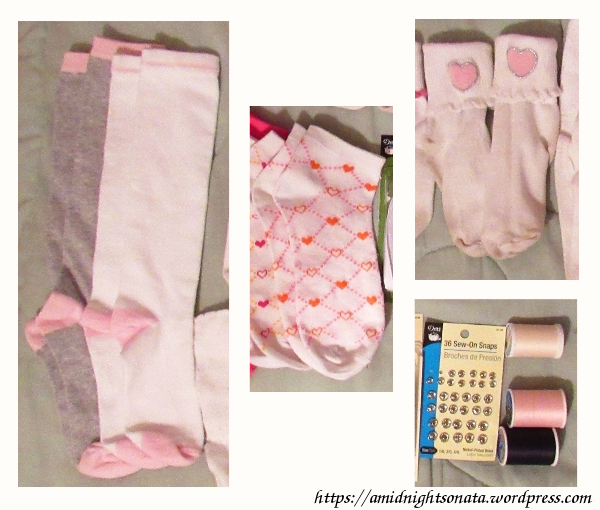 They were cut from the top of the white knee socks, so they would have that cute pink stripe. It looks quite sporty, no? There was one pink-stripe hem left after the socks were finished. Inspiration struck: What accessory is sporty yet fashionable, and typically made from knit fabric? A wristband, of course! So the last hem became a wristband and, with the last little scraps, a hair scrunchy with a bow to pull her hair into a ponytail. Cute and practical! Each piece was entirely hand-sewn, with the exception of the heart appliqué, which was attached with fabric glue. The shirt hems were finished with scalloped blanket stitch for a lacy look. The knitted fabric was a bit tricky to work with, as you must pull the stitch through gently or the fabric will stretch. 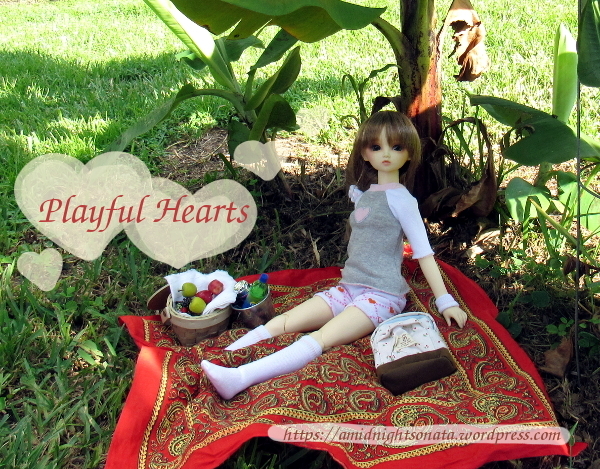 However, it is a very forgiving fabric that drapes well, so I forgave it that little difficulty! I hope you enjoyed seeing this outfit! Soon I will also share my other contest entry. Please look forward to it! And now, a question for you! 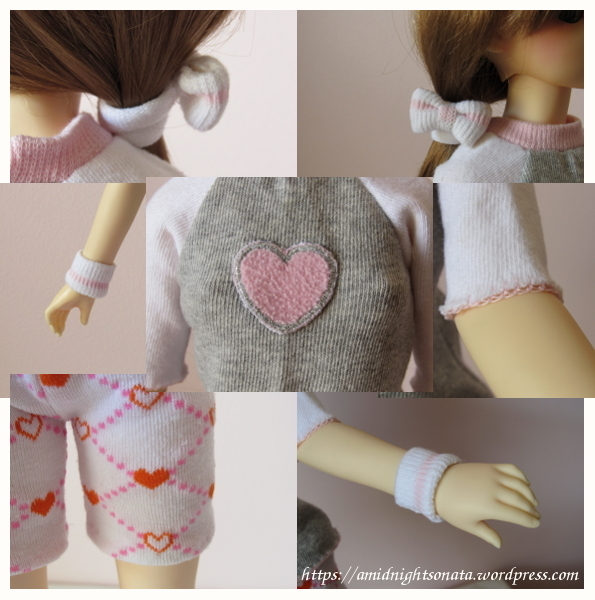 Have you ever made a sock outfit? How did it turn out? I’d love to hear from you in the comments!